Perhaps the biggest announcement this week is that McFly are doing another tour of smaller venues around the country, calling at the Astoria on Thursday 18th October. Tickets go on sale on Saturday morning at 10am reportedly. Expect throngs of sweaty teenage girls, screams and queues from lunchtime when they hit the capital. Rodrigo y Gabriela are playing Hammersmith Apollo on Sunday 9th December. Tickets went on sale this morning at 9am. Wilco have announced that they’ll play their alt-country tunes at Brixton Academy on Monday 5th November. Jamie Cullum is doing a very special one off show at the Forum on Friday 7th September – tickets are on sale now at £17.50 if you don’t mind standing or £19 for a seat. Expect special guests galore. 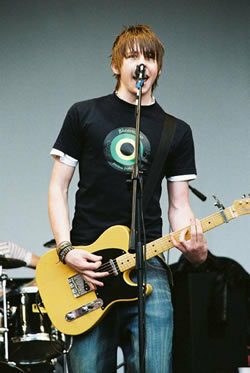 Photo of McFly's Danny taken from Laura Watson's flickr stream under the Creative Commons License.